This bike is three decades old, but I’m willing to bet that there are few modern machines that could keep up with it. Suzuki launched the GSX1100E right at the end of the 70s, pitching it as a heavyweight musclebike for the touring market. And yes, it had muscle aplenty: with an output of around 100 bhp, it was one of the quickest production bikes you could buy. 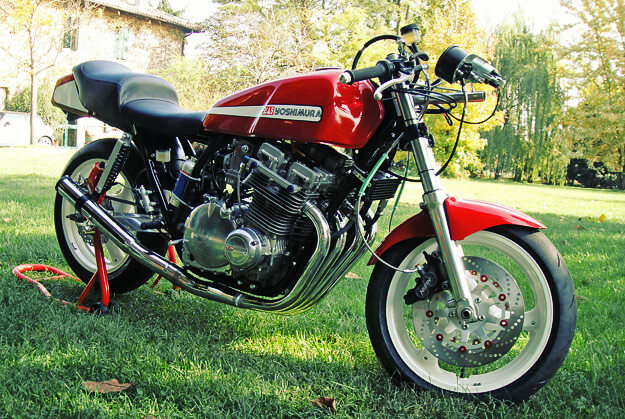 This pristine example is owned by reader Federico from Italy, who has restored and customised his 1980 model as a tribute to Hideo “Pops” Yoshimura. This particular GSX has considerably more power than the original: Federico has rebuilt the motor using Wiseco 1135cc pistons, WebCam cams and Ape valve springs. It’s breathing through 33mm Keihin carbs, with a Dyna ignition and coils providing the spark. An aftermarket oil radiator keeps temperatures down, and a Barnett clutch transmits the power to the back wheel. (Which is from a 1989 Suzuki GSX-R—as are the forks, front wheel and front brakes.) The frame is braced and lightened, and Pirelli Diablo SC2 tires help keep the shiny side up. A sweet machine, and one to steer clear of at the traffic light Grand Prix.